Aside from the people who are vegan, most everyone I know buys meat, eggs, or dairy at some point during the week/month/year. And those of you who do – have much more buying power than you probably even realize. By buying welfare-certified animal products, or more plant-based products, you send a strong message to food companies that you care about the treatment of farm animals. Just an average size family spends hundreds of dollars a month on meat. Imagine if every single consumer used that buying power to purchase welfare-certified meat instead of the meat from inhumane factory farms. What a difference that would make! As you may already know, most of the nearly 9 billion animals raised for meat, milk and eggs in the US are suffering in inhumane factory farms. And animals are not the only affected, as factory farms impact human health—they can be breeding grounds for dangerous pathogens and the antibiotics used to prevent disease create the potential for dangerous, drug-resistant bacteria to develop. 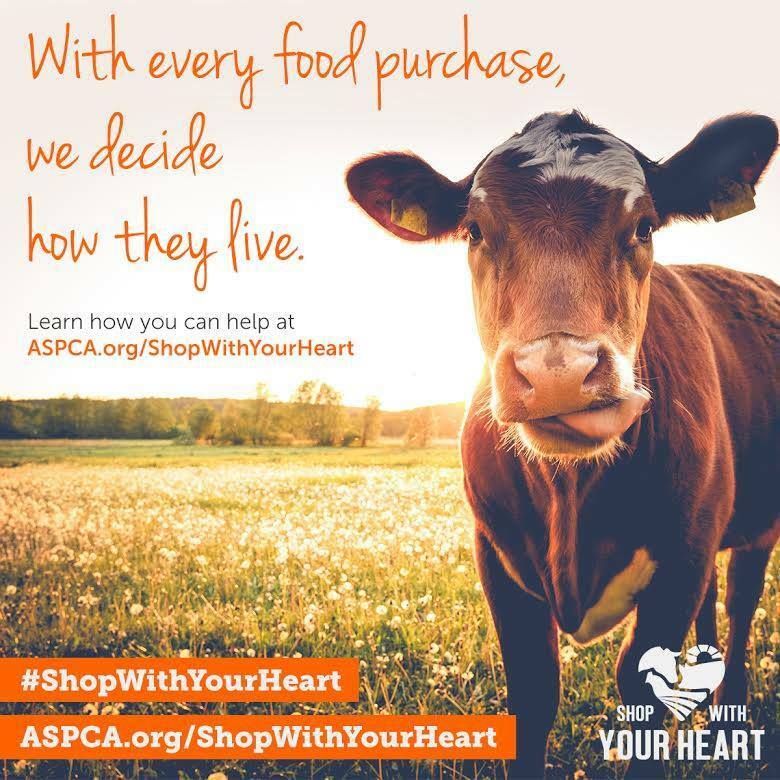 To fully harness the power of our collective purchases and demand better lives for farm animals, the Shop With Your Heart initiative launched by the ASPCA gives consumers the resources to recognize, locate and demand meaningfully welfare-certified meat, eggs and dairy products as well as plant-based alternatives. Everyone who signs the pledge also gains access to an exclusive Shop With Your Heart Grocery List, including welfare-certified and widely available plant-based brands. Make Heart Hands for Farm Animals! Pose with your hands in a heart shape and post a photo using the tag #shopwithyourheart and @ASPCA to let your friends know you believe in a more humane world for farm animals. Don’t forget to tell them where you shop to find more humane products—give the stores a shout-out by tagging them, too! Love this!! I took the pledge!! Thanks for sharing this post. I have been trying to do this too. I think we should all do our part. I'm conscientious about what I will buy. I once had a mini-mini farm with chickens and a goat and other critters, and I miss having them much, but I know how important it is to be humane to these animals. I eat mostly beans and grains, not much animal products, anyway.